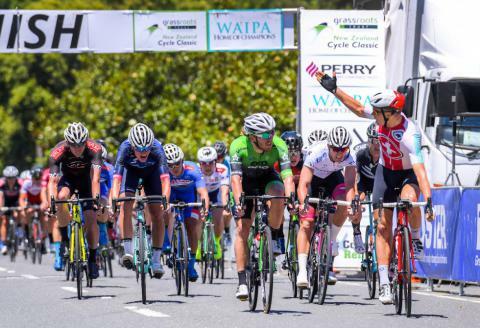 A photo finish was required to determine the winner of stage two of the 2019 Grassroots Trust New Zealand Cycle Classic held on the outskirts of Cambridge today, following aggressive riding by the Swiss National Team. After making several solo attacks and leading off the front for the majority of the 129km stage, Swiss rider Cyrille Thiery left it to his U23 team mate Stefan Bissegger to take line honours by a whisker from EVO Pro’s Shane Archbold in a sprint finish that overlooked Lake Karapiro. Bissegger won the stage in 3hr 5min 16 secs, with Archbold in second and third place being awarded to Blake Quick (St George Continental). James Oram was the first New Zealand National team member home in fifth place while EVO Pro’s Aaron Gate crossed the line in 10th - and retained the overall Tour’s yellow jersey. Thiery ended up crossing the line in 29th place but his dominating riding earned him the Winger Suzuki Most Aggressive Rider Jersey and the Three Peaks Manuka Honey King of the Mountain Jersey while Bissegger also picked up the Foster Construction U23 Jersey and the BNZ Sprint jersey. Race director Jorge Sandoval said the Swiss team’s performance was impressive and added to an exciting day of racing. “Obviously the Swiss just dominated today and I congratulate them. The finish was very exciting especially for all the spectators to see a big bunch sprint like that,” said Sandoval. After the day began on slightly wet road conditions following rain in the morning, it cleared to blues skies and a scorcher of an afternoon. From the get-go, the peleton was animated with several riders attacking off the front, but at 38km, what would become the main breakaway group, formed with six riders from the New Zealand National team, Japanese team KINAN, Oliver’s Real Food and Thiery. Working well together and taking turns to lead, the riders wound their way through rolling countryside and maintained a one minute lead on the peleton. After one rider dropped back, the breakaway of five extended their lead to 1min 38secs when crossing the Arapuni Dam bridge at the 100km mark; but after the final King of the Mountain stage they were absorbed back into the peleton. With 10km to go Oliver’s, BridgeLane and EVO Pro worked hard to organise themselves for the final leg before KINAN and the Kiwis drove out in front again with 3km to go. It came down to a fast and furious bunch sprint for the finish line with a photo finish required to determine the winner. Overlooking the shores of Lake Karapiro afterwards, Thiery said it was never his plan to start the day going alone and he hoped a small breakaway would eventually join him. It was a strange tactic … but it ended up working. It also set up Bissenger to take the stage victory. “For me it was pretty cool – there was always something going on – it was a bit hilly and during the sprint I was just searching for the line, searching for that great position to get over the line,” said Bissenger. Gate, who won the opening stage yesterday, retained his yellow jersey after his team mates worked hard to control the breakaway – never letting it get out more than 1m 30 secs from the front of the peleton. Gate described the second stage as “hectic racing” but thanked his teammates for doing their job and is now looking ahead to the 152km stage three beginning and finishing in Te Awamutu tomorrow morning.